There are many ways to get a gift for someone special, but sometimes there is little time to do the shopping that might show more effort. Sometimes all the time you have left is to grab a gift certificate for their favorite place to shop and hope they understand that it comes from the heart. With the use of this gift certificate template you can be a little more creative when giving a gift certificate to that special someone. This gift certificate template is a beautiful design that is sure to stand out, and definitely be different than any other that you will find over the counter. 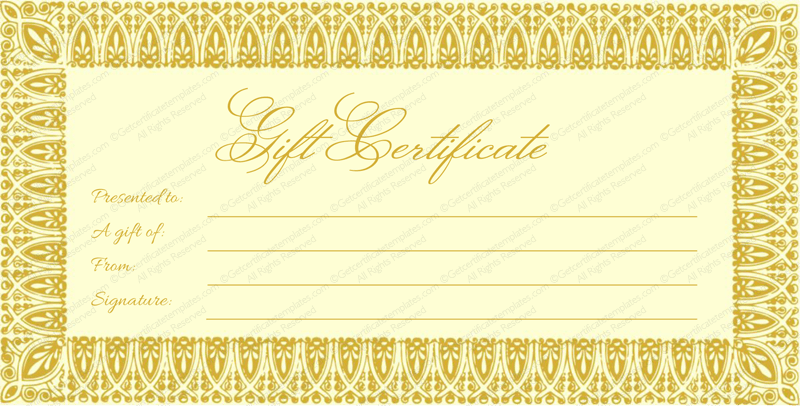 Plus, this gift certificate template is one that you can alter to fit your own needs. You can add your own wishes to it, and make it personal for each person you send it to. Once you have it printed simply have it certified by the store you want to use it at.